Is Bigfoot real? This is a question that is often debated among people interested in strange phenomena, cryptozoology and other similar topics. Many people have spent years of their lives searching for evidence that Bigfoot exists. If they do exist, do they migrate? Do they build shelters? What do they eat? These are all very important questions in order to establish whether Bigfoot’s truly exist or not. Bigfoot sightings have taken place as well as been documented, for hundreds of years over a large number of regions of the world. There are so many unanswered questions about Bigfoot that many people do not believe they really exist. When people pull hoaxes, it doesn’t help find these answers. Cryptozoologists and Bigfoot hunters continue to look for positive evidence of its existence. There are reports of people seeing a creature we now call Bigfoot for centuries. Bigfoot encounters have taken place all over the world. In Asia, this creature is known as Yeti. In North America, it is known as Sasquatch or Bigfoot. Native Americans have tales of Bigfoot that go back many generations. In 1811, a man in Canada reported a creature whose description fit Bigfoot. In 1924, the first Bigfoot attack was reported in Washington State when rocks were thrown at a miner’s cabin. In the 1950s, the name Bigfoot was coined when people discovered footprints of the creature and made casts of them. It is estimated by cryptozoologists that 4000 to 6000 Bigfoot’s roam North America today. Bigfoot, even though seemingly curious about humans, in most cases avoids human contact. Every so often, someone has a camera ready when they spot Bigfoot. Of course, Bigfoot isn’t one to sit for his portrait; most of these photos are blurry and Bigfoot is hard to see clearly. Nonetheless, these photos exist. Something was there in the trees whether it was Bigfoot or not is always the question. The most famous film clip of Bigfoot is the 1967 footage shot in northern California by Roger Patterson and Robert Gimlin. It has been studied repeatedly over the years, with mixed reactions. Several more videos have surfaced over the years, but none of them are as clear as the Patterson-Gimlin footage. Video evidence is still very controversial and it will probably take a Bigfoot body dead or alive to establish the fact that Bigfoot is real. Footprint evidence has been discovered in many parts of the world over the past seventy years. Photographs of the footprints have been taken, and plaster has been put into the prints to make casts. Some casts are clear enough to show dermal ridges on the skin. Footprints have been found in Washington, Oregon, Canada, Ohio and many other places. While some footprints have been faked, these forgeries are fairly easy to discern due to the lack of differences between prints. While a body of a Bigfoot has never been found, some people have found tufts of coarse hair in the bushes of areas where they have been seen. Some people also claim to have found Bigfoot feces, remains of meals and other evidence. Scientific examination of these findings has been inconclusive. Contrary to popular belief with Bigfoot researchers there has been no biological material proven to be from a Bigfoot creature. Some people have reported hearing haunting screams and growls when out in the forests. A few of these Bigfoot sounds have been recorded. It is thought that there are different calls to warn of danger or send other messages, though it is hard to analyze these recordings without knowing more about the animal itself. Adult males, females, children as well as elderly Bigfoot’s have been reportedly identified, by Bigfoot researchers. 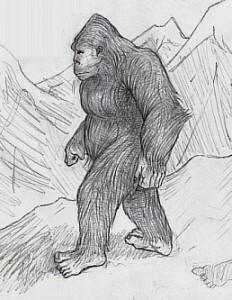 Descriptions of Bigfoot have varied in height, body weight, and also coloration. Generally speaking Bigfoot is described as being 8 to 10 feet tall and weighing between 600 and 800 pounds. Of course just like humans there is variance observed as well during different Bigfoot encounters reported. This website is very helpful for those people who engaged bigfoot research. This is also educational website. There are many bigfoot related topics which is very important for bigfoot research. Thank you. Big foot is a bunch or baloney. These people are miss identifying a bear, elk of something. Also my personal belief is that the socialist secular humanists injected this lie into the sub consciousness of the masses to bolster the validity of evolutionist theory, since critics always ask where to find the half ape today, if indeed men came from apes in the past. Combine the power of suggestion with fear upon the sight of an unidentified creature, and suddenly you have a hundred big foot sightings!!!! That is my personal belief!!! My dear Harry, I too used to be a shallow minded nonbeliever intent on making people who saw such a creature that we were taught our whole lives didn’t exist, look like fools and loved making fun of them.Then one day as my crew and I were commercially picking wild mushrooms it happened! My crew were yelling to me to get in the van as a very large wild man was watching them from the treeline and they would not get out of the van and wanted to leave right now! I always carried a 9mm pistol in case of a cougar or bear issue and talked one of my workers to take me to the spot where they saw this wildman and looked at the ground and saw what looked like a size 14 footprint and branches of trees the size of my arms snapped off about 2 feet above my 6 foot 4 inch body and was scared for a moment, but I was armed so I felt safe. I didn’t see or hear anything so I was on my way to the van to get my workers back to work, when a scream that I have never before heard in the woods or care to again, came out of the woods not 50 feet to my right! I heard something moving to the right of me coming toward the treeline and to this day it sounded like King Kong coming! I took off running for the van and heard my workers screaming and were terrified and were pointing at something up on the hill and when I got to the van I turned and looked and there stood a huge 8 and a half foot beast of a man, not a bear like the nice park ranger wanted me to believe that I reported it to, with a massive body that if I would have shot him with a 9mm, he would have killed me instantly! It stood there for about 5 minutes and screamed at us again and disappeared into the woods. I have photos on my cell phone as proof and have never been in the woods since! Oh no Harry they do exist and if you would love to go camping about the end of September for a couple nights , I will take you and drop you off and come back and get you if are still alive. Thank You Mark, I too have heard that Scream, very close, and it froze us , 4 guys night fishing, in a wide creek, It came from across the creek on a cliff about 50 foot high. It threw a boulder in the middle of the creek, about the size of a vw bug. It knocked all 16 of our poles to the ground, and all 4 coleman lanterns were knocked over, in the pitch black, it screamed again, we then unfroze, and ran to the car and left everything. This is a site dedicated to the research on Bigfoot, a.k.a Sasquatch and Yeti. Our mission is not to make you believe or not, but to supply the information and let you be the judge. Just have a open mind and a sense of humor!